There was a time when all of Christian Europe found itself excommunicated, without there being any heretic. 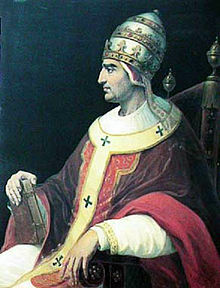 It all began on March 27th 1378, fourteen months after Pope Gregory XI had returned to Rome from Avignon to die. At the conclave, which took place in the Vatican for the first time in 75 years, sixteen cardinals participated, of the twenty three then present in Christendom. Of these, the great majority were French. This was a result of the long period in Avignon. On April 8th, the Sacred College elected the Archbishop of Bari to the Papal Throne. Bartholomew Prignano, a learned canonist of austere habits, was not a cardinal and so was not present at the conclave. That same day, the people burst into the conclave demanding the election of a Roman Pope, but the cardinals did not dare indicate the election that had already taken place and made believe the one elected was old Cardinal Francesco Tibaldeschi, a native of Rome. The following day however, Bartholomew Prignano was enthroned, taking the name of Urban VI (1379-1389) and on April 18th was duly crowned in St. Peter’s. It came to pass though, that in the month of July, twelve French cardinals, along with the Aragonese Pedro de Luna, met together in the city of Anagni, where on August 2nd, they affixed a declaratio, wherein the Holy See was determined vacant, considering the election of Urban VI invalid, as it had been extorted by the Roman populace through rebellion and tumult. On September 20th in the Cathedral of Fondi, Cardinal Robert of Geneva was elected as the new Pope and took the name of Clement VII (1378-1394). After a vain attempt at occupying Rome, he was installed again in Avignon. Thus began the “Great Western Schism ”. The difference between the Western Schism and the Oriental Schism, which from 1054 divided Christianity, is that the latter was a schism in the strict sense of the word, since the Orthodox refused and still refuse to recognise the Primacy of the Pope, Bishop of Rome and Pastor of the Universal Church. The Western Schism on the other hand, was material schism, not formal, as there was no will on either part to negate the Pontifical Primacy. Urban VI and Clement VII, followed by their successors, were convinced of the legitimacy of their canonical election and there were no doctrinal errors from either part in conflict. Today the Church assures us that the legitimate Popes were Urban VI and the popes that followed him, but at the time it was not clear how to distinguish who the legitimate Vicar of Christ was. From 1378, Christendom divided itself into two “obediences”. France, Scotland, Castile, Portugal, Savoy, Aragon and Navarre recognized Clement VII. Northern and Central Italy, the Empire, England and Ireland, Bohemia, Poland and Hungary remained faithful to Urban VI. 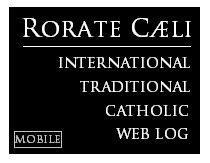 For more than forty years, European Catholics underwent drama on a daily basis. Not only were there two Popes and two colleges of cardinals, but often in the same diocese there were two bishops, two abbots and two parish priests. Further, since the two Popes each excommunicated the other, individual faithful Christians found themselves excommunicated by one Pope or the other. Even the Saints were divided. Against St. Catherine of Siena and St. Catherine of Sweden (a daughter of St. Brigitte) who supported Urban VI, were St. Vincent Ferrer, Blessed Peter of Luxemburg and St. Colette of Corbie, who adhered to the Avignon obedience. The situation was very confusing and to say the least, it was difficult to find a way out of it. On September 16th 1394, when Clement VII, the Avignon Pope, suddenly died, the time to unravel the knot seemed to have arrived. All that was needed was for the French Cardinals not to proceed with the election of a new Pontiff and for the Pope of Rome, Boniface IX (1389 – 1404), the successor of Urban VI, to resign. Instead, the cardinals of Avignon elected a new Pope, Pedro de Luna, an austere but obstinate man, who strongly reclaimed his rights and reigned for 22 years, under the name of Benedict XIII (1394-1422). Boniface IX’s successors on the other hand, were the “Roman” Popes, Innocence VII (1404-1406) and Gregory XII (1406-1415). In the meantime, discussions continued to develop among theologians. The point of departure was the famous passage from the Decretum Gratiani, that said: “Let no mortal man presume to accuse the Pope of fault, for, it being incumbent upon him to judge all, he should be judged by no one, unless he is suddenly caught deviating from the faith” (A nemine est judicandus, nisi deprehenditur a fide devius) (Dist. 400, c. 6). 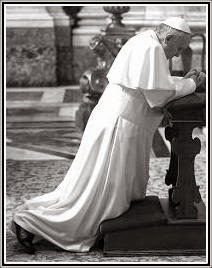 The rule according to which nobody can judge the Pope (Prima sedes non judicabitur) admitted, and admits, one sole exception: the sin of heresy. It was a maxim upon which all could agree and could be applied to a heretical Pope as well as a schismatic Pope. But which one was guilty of schism? Many, in order to resolve the problem fell into a gravely dangerous error: the doctrine of conciliarism, according to which a heretical or schismatic Pope can be deposed by a Council, as the assembly of bishops is superior to the Pope. Leading exponents of this doctrine were the Chancellor of the University at Paris, Pierre d’Ailly (1350-1420) and the Avignon Cardinal and theologian Jean Gerson (1363-1429), also a Chancellor and Professor at the University of Paris. This false ecclesiological thesis induced some cardinals of the two obediences to seek a solution in a General Council which opened at Pisa on March 25th 1409, with the aim of inviting the two Popes to abdicate, and to depose them if they refused. Which is exactly what happened. The Council of Pisa declared itself ecumenical and representative of the entire universal Church and deposed the two rival Popes as “schismatics and heretics” declaring the Roman See vacant. On June 26th, the College of Cardinals elected a third Pope, Peter Phillarges, Archbishop of Milan, who took the name of Alexander V (1409-1410) who was then succeeded the following year by Baldassarre Cossa, who took the name of John XXIII (1419-1415). The true Pope could only have been one, but at that time this was not clear to either the theologians or the lay faithful. John XXIII, with the support of the German Emperor, Sigismund (1410-1437) took the initiative [of calling] a new council which opened in the imperial city of Konstanz on November 5th 1414. His objective was that he be acknowledged as the one and only Pope, confirming the Council of Pisa from which he drew legitimacy. Towards this end he had created many Italian cardinals who supported him. In order to overcome the Italian majority, the French and the English succeeded in allowing the vote to be expressed not by capita singulorum, but by nations, that is, national groups. The right to vote was given to France, Germany, England, Italy and afterwards to Spain: the five most important European nations. It was a profoundly revolutionary principle. In the first place, in fact, the nations – i.e. political subjects - entered heavily into the life of the Church, subverting the relationship of dependence they had always had with the Church. In the second place, and most of all, the principle according to which the Pope is the supreme arbiter, moderator and judge of the Council was undermined, conferring the deliberative decisions to the vote of the Council Fathers. When John XXIII understood that the Council did not want to confirm him as Pope, on the night of March 20th and 21st 1415, he fled to Konstanz, but was caught, deposed as a simoniac and public sinner and excluded, like the other two Popes, from any future election. On April 5th 1415, the assembly emanated a decree known as Haec Sancta wherein it was solemnly affirmed that the Council, assisted by the Holy Spirit, represented the entire Church Militant and had its power directly from God: therefore every Christian, including the Pope, was obliged to obey. Haec Sancta is one of the most revolutionary documents in the history of the Church, as it denies the Primacy of the Roman Pontiff over the Council. This text, first acknowledged as authentic and legitimate, was only successively tried again by the Pontifical Magisterium. It was completed, on a disciplinary level, by the decree Frequens of October 9th 1417 for which the ecumenical Councils had to be rendered a stable ecclesiastical institution and as a consequence “a kind of demand for control of the Papacy,” as the historian Hubert Jedin writes. In this chaotic situation, the Roman Pope, Gregory XII, consented to abdicate. This was the last renunciation to the Pontifical Throne before that of Benedict XVI. Gregory XII lost all pontifical prerogatives, as happens to a Pope, who, for extraordinary reasons, abandons the governing of the Church. The Council recognized him as a cardinal, nominated him Bishop of Porto and stable legate to the district of Ancona, but Gregory died at the age of 90 at Recanati on October 18th 1417, before the new Pope was even elected. The Avignonese Pope, Benedict XIII remained immovable, but was eventually abandoned by the countries under obedience to him and deposed as a perjurer, schismatic and heretic on July 26th 1417. The cardinals of the two obediences met together and on November 11th, 1417 finally elected the new Pope, Otto Colonna, a Roman, who took the name of Martin V (1417-1431) in honour of the saint celebrated the day of his election. The Great Western Schism was brought to a conclusion and peace appeared to have arrived in the Church, but the post-Council reserved bitter surprises for Martin V’s successor.